Update: After the first rain, the brim on the scarecrow’s hat was flexible, so it absorbed water. It wasn’t sticky, like it was before the clay dried, but it wasn’t solid, either. At this point, I recommend that you read up on the two experiments shown on this site that did actually work: Julie’s mountain lion, made with Quickwall cement over paper mache clay, and Jackie’s Goddess, made with thin set tile mortar over paper mache clay. The paper mache clay Scarecrow sculpture finally got his final coat of the Trojan Masonry and Concrete Sealer, and now we wait and see what happens. After I poured all the over-sprayed sealer back into the container, I could see that I only used a few cups of the product. If this works, there will be plenty left for other projects. I’m getting excited about outdoor sculptures, and I ordered several books about sculpting with concrete. I’ll do some experiments with the recipes and techniques I learn, if you all happen to be interested. Not really “paper mache” related, but I think it might be fun to learn. But for now, wish our friend Scarecrow luck – we have a few more storms on the way, so it might not be long before we find out if this experiment worked or not. If it looks like the sealer really is working, I’ll go ahead and coat him with the Sculpt Nouveau iron coating so he’ll look like a cast iron sculpture, and then find a permanent spot for him in the garden. He’ll look a lot better if that white bucket is buried in the ground. I don’t think the product was the problem — I think it was the application. You can cover your work 99.99999%, and you will have failure. One tiny untreated spot the size of the hole made by a straight pin will allow water to enter. I would apply the coating with a paint brush, with a lot of the application being of the ‘shove it in’ type, using the tips of the bristles to force it into the small nooks and crannies. I think that any spot that has a rough surface would be a red flag for prospective failure. I’m sure that you’ve noticed that when you coat something rough with a liquid, the coating will often settle or soak in, and if you look closely a few areas will form a sort of bubble, and as the coating settles, the surface of the bubble gets thinner, and often ‘pops’, leaving a small uncovered spot. And that tiny spot is the death knell for paper mache. All good suggestions, Sue – but someone else will have to experiment with them. You’re absolutely right when you say that all it takes is a pinhole to let in the water, and once that happens, it’s just a matter of time before the sculpture is destroyed. I’ve decided that it makes so much more sense to make outdoor sculptures with products that don’t need to be encased in plastic to stay alive. Paper just wasn’t made to be left out in the rain, and most sealers will eventually fail from UV rays, freezing and thawing, wind-blown sand, etc. They can be reapplied, but that’s a chore I’m not too excited about. And I don’t like spending so much time to make temporary sculptures, so I’m going to keep my paper mache sculpts inside, and use other materials for outside displays. Thanks, however, for the instructions – a lot of people make temporary displays for Halloween and Christmas, and will find your tips really useful. In that case, though, they should use marine varnish instead of the concrete sealer I tried. It’s less expensive, and it’s been used successfully for a lot of temporary outdoor displays. Untill now…what is the best way to protect your creation outdoor? I’ve personally given up on putting any kind of paper mache outside. Other materials are better suited for sculptures that have to stand in the rain. Like concrete, for instance. Otherwise, you’d need a solid layer of plastic over the paper mache, and then reapply the plastic at least once a year as the sun causes it to crack. I’m keeping my paper mache in the house. But if you try something, and it works for you, be sure and let us know. I have been a fan of your work for a while now and I love your videos on you tube. I’m really just getting started in paper mache but would very much so like to make a dragon that can be left outside. I recently found a posting on another web site gourmetpapermache.com where he shows a dragon he made that has been outside for five years and looks great. He mentions that he used exterior grade wood glue instead of flour for the paper mache, but doesn’t really go into detail about the process. I was wondering if this is a method you r familiar with and if so could you make a video on how to do this ? Thank you for your time and please keep the videos coming it is truly a pleasure to watch and learn from you. Hi Brian. I am not familiar with that method, and haven’t seen Dan’s post – but I would really like to see how he’s doing it. All of the waterproofing methods I’ve tried have failed miserably. Could you give us a link to Dan’s post on this subject so we can see how he’s doing it? I’d love to give it a try, and I would definitely make a video. I can imagine that the local kids really get a kick out of seeing that dragon as they head for school every morning! The process Dan describes at the bottom of that post is really simple – just buy some good exterior glue, and build something! I just saw some of your art on Pinterest and clicked through and found this site. I have made many things out of paper mache and coated them with auto/car Bondo. (A can of putty and a tube of liquid hardener) It is basically plastic cement. Works, things I have made are years old and still kicking. I do not have photos, as the things I made were for parade floats, kids events..then I wanted to save them so coated, sanded, painted them. As with most all art I do they go to others, given or sold away…so no picts. And I am one of those artists that if I kept a pict. or a piece I would just pick it apart mentally of how I could have done it better. Hi Dawn. I have experimented recently with a similar product that stays workable longer. It’s called Magic Sculpt. I bought some because I used some Apoxie sculpt on my raccoon, and enjoyed it, but I got frustrated because it hardened so quickly. Then I saw a video on the Stan Winston site, showing how to make a mask with the Magic Sculpt, and I ordered some. I still haven’t done much with it, though. It’s expensive, so making a whole sculpture with it would cost quite a lot. Is the Bondo less expensive? How big do you usually make your sculptures? And when you make the next one, would you be interested in taking progress photos and write up a tutorial for us, so we can see you you do it? 3. coat with bondo after it dries? Hi Kristen. I don’t know if Dawn is still watching for replies to her comment, but I might be able to help. The putty she referred to is the Bondo. I know a lot of people use that product, perhaps because you can buy it at your local DIY store, but it hardens really fast. Another epoxy product that you would have more fun with is the epoxy clay. You have at least an hour to work with it before it gets too hard. There are several brands, but the easiest one to find is Apoxie Sculpt. If you use that product you don’t need any paper mache under it. You can see how I used epoxy clay to make a small outdoor squirrel sculpture here. I used a different brand, but they all work pretty much the same. I must have missed your last post to me Jonni, sry. I remember the problem being how to coat paper mache so it will hold up outside. Kristen: There are instructions on the can of Bondo (it is a plastic.) There are other products that are about the same thing with other names. (such as in the youtube videos I just searched to possibly help you understand how to use it (you can search for more.) 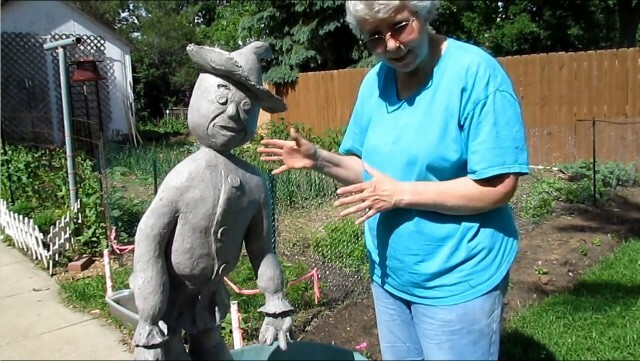 I also found a couple making some yard sculptures they are coating with plaster. That would also be a good weather coating. I wish you all great luck with your projects. I made a large rabbit for my front porch a couple years ago. At the time I used a large upholstery tube for the center brace and then just began using newspaper, plastic Ingles bags, and duct tape to form him. Then I used paper mache to cover him to continue forming him. I spray painted him with paint. Then to give him texture I sprinkled the powder granules before the paint dried. Afterwards, I used a spray poly to keep him from absorbing moisture. This was not sufficient, so I just bring him in during the wet seasons. I am looking for a better way to preserve him. Patsy, I’ve been trying to find a foolproof way to waterproof paper mache, but I just can’t get anything to work. I’m now totally convinced that concrete is the way to go for outdoor sculptures. A hundred years ago they were able to make boats with paper mache, but they used some pretty dangerous materials to waterproof the paper, and some expensive machinery. Now we try spraying with various forms of plastic, but if even a pinhole is left uncovered, water will find it’s way in. Your rabbit will probably need to keep coming back inside whenever rain threatens. I look at your web site from time to time and see alot of people asking how do I water tight paper mache well I made a 7ft 4in giraffe and she has been out in the elements for 2 month and where I live it has rained at least 3-4 times a week and she is in the Sun. She looks as good as the day I put her out there, and I check her everyday to make sure. This is what I do. After she was finished with just paper mache I coated her with Olympic clear waterproofing sealant, then put a coat of valspar exterior white, use valspar exterior to fininish her with the right colors when dry sprayed her with Krylon exterior to protect outside paint and she is still good. Thanks, Kathleen. Do you have a photo of your giraffe you’d like to share with us? I’d love to see it. Good luck on the scarecrow, and I too will be waiting with bated breath to see how he holds up. 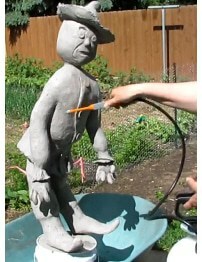 If that is the case, there is no stopping anyone from making their own outside sculptures. Scarecrow Luck! He already seems to be scaring the crows. Oh, such fun! Great overall project and hoping that you have found the Holy Grail of waterproofing. This just may be a winner. Regards and thanks for such great tutorials. Do you think it was Scarecrow causing that ruckus with the birds? I could barely hear myself think! Perhaps. Something unfamiliar in their territory. But it may also be totally unrelated. At least in my backyard, critters will squawk and chatter if anything different is added to the yard. I totally love your scarecrow!!! Wonder if you could put him on one of those planters that have the wheels/rollers on the bottom to move him since that bucket is so heavy. Of course that would move so well in the garden but for a patio sculpture it might be good. My old back doesn’t do so well on heavy stuff anymore. Anyway I will have to put this one in my “want to do list”. Thanks for you generous mind working plans and also to the other artists like Jackie and the one that did that gorgeous mountain lion. Wheels would be a great idea, especially if you wanted to move him around. It wasn’t easy getting the Scarecrow onto the wheelbarrow, and then back off again. Maybe 20 years ago it would have been easier. 🙂 On a deck, a four-legged sculpture would probably do just fine without the concrete base, but we get 70 mph winds here, so anything outside needs to be tied down pretty good. Good grief you would have to use tie downs, ha-ha Can you imagine have him hold a kite!